Egnyte, a multi-cultural & multi-disciplined company receiving regular appreciation and recognition from leading news media – is a reliable contender in the cloud storage business trusted by millions. Its multicultural environment helps to bring distinctive and bright ideas to facilitate perspectives which prefers creativity and excellence. It enables immediate productivity with easy process & secured network. Egnyte Cloud unparalleled online backup, file sharing and large file transfer and collaboration services for businesses and individuals. It offers rapid access to stored documents. With their brilliant team of professionals and skilled engineers, bringing valuable experience from their previous globally recognized employers like Oracle and Cisco. 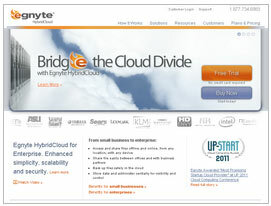 Egnyte provides on demand cloud infrastructure services to small, medium sized and large organization. Egnyte is proud to introduce and deliver some of the widely utilized and greatly acclaimed services in the cloud environment. More than one billion files are shared by customers over Egnyte cloud on a daily basis. Its innovative cloud technology offers robust security and lighting fast speed for online storage. Egnyte was founded in 2007 and currently headquartered in Mountain View, California. Its excellence can be judged by venture capital firms backing it; Google Ventures, Kleiner Perkins Caufield & Byers, Polaris Ventures Partners and Floodgate Fund. Egnyte Cloud File Server provides businesses with Online Cloud Storage, FTP Site, FTP Server, File Sharing, Cloud Storage services.